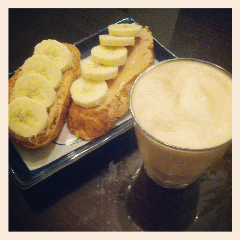 Homemade café latte & peanut butter with banana on toast. Yum. The curious thing that's FC Barcelona right now. I speak in a mixture of Chinese and US accent with a little British thrown in here and there. I write silly stories in my spare time. A little too obsessed with superficial things like shoes, and bags, and makeup. I used to make espresso at home but now own a Nespresso machine. My favorite foods are sushi, spicy Shanxi noodles, pasta, and broccoli.